A lack of sensitivity to colour and a poor knowledge of colour theory has long been something which I feel has hindered my development in watercolour. I spend hours on instagram and Pinterest, poring over the work of other artists, with perfect blending and perfect complimentary colours, trying to replicate their accomplished techniques. It’s taken me a couple of years since I started working on my watercolour skills in earnest to finally feel that I’m making some headway with colour theory. It has also taken a lot of reading, a lot of studying colour palettes, and a lot of sketchbook experimentation, but from the pieces I’ve produced over the past week, I think I’m getting it! 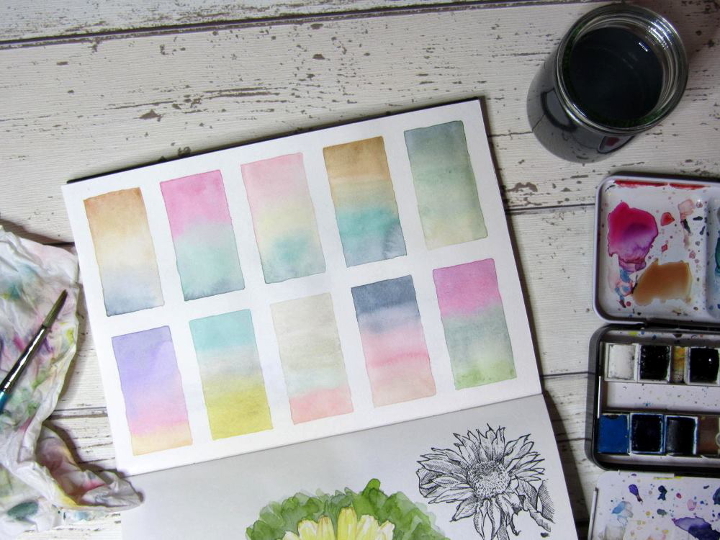 I could, of course, have saved myself a lot of time and effort by taking a watercolour workshop, but being the stubborn person that I am, I figured that there was no reason to spend money with all the resources available online, if only I had the time and motivation to explore them. So, this week I did something which I should have done a long time ago. I painted a page of colour combinations which I like. They were inspired by my Pinterest procrastinations and the palettes used by other artists who I admire. Once I’d finished, I posted the result on my Facebook page, encouraging comments from all and sundry. I knew which combinations I liked, but I wanted to know what appealed to others. As expected, opinions varied, but there was resounding affection for the purple, pink and yellow combination, bottom left. 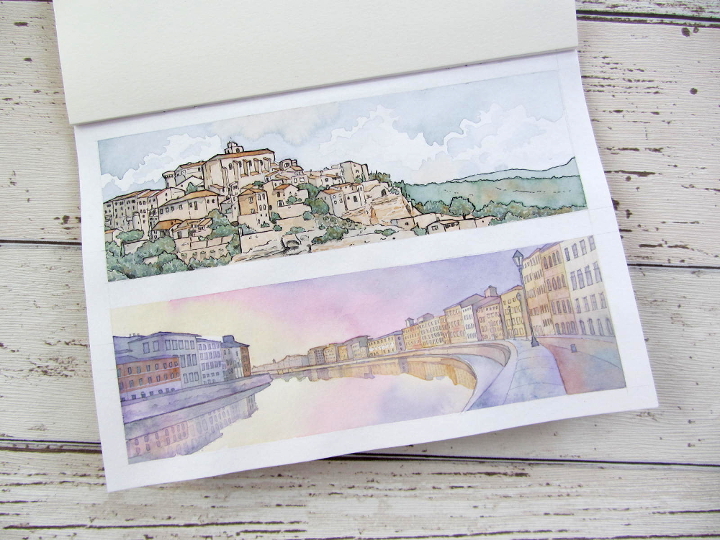 I decided to do some experimental townscapes (given that I’m quite into urban sketching at the moment), each one sticking religiously to a colour combination. 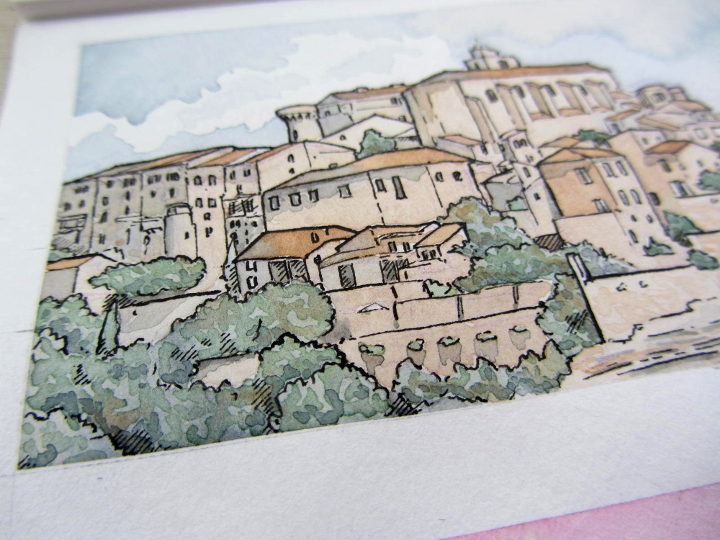 The idea was to improve on my previous painting of Peratallada, using a limited palette to make the piece more cohesive (does that even make sense?). I used glazing and wet on wet mixing to bring the colours together and give the pieces depth. My boyfriend, Sam, looked after our little Munchkin all day on Sunday so that I had a good chunk of time to paint. My favourite combination, inspired by French artist Jérémy Soheylian, was dark navy, sunset orange and dusky green (not their technical names!). I searched online for a suitable subject and settled on a photo of the beautiful town of Gordes in France. Sam likes it because it looks ‘Game of Thrones-y’! The second combination I tried was the one voted for by my Facebook followers. They made a good choice I think! I specifically searched for a sunset photo and tweaked the colours in my painting to fit the limited palette. I love the way that the glazing adds so much depth and interest – the colour mixing reminds me of the effect achieved by one of my favourite artists on Facebook – Kate Lycett. I’m feeling so positive about painting right now, and so excited to do more! PS. I’m really excited to share that I am a guest blogger this week over at Heart Handmade UK – take a look at my paper cutting post with free PDF template. So beautiful Clare! 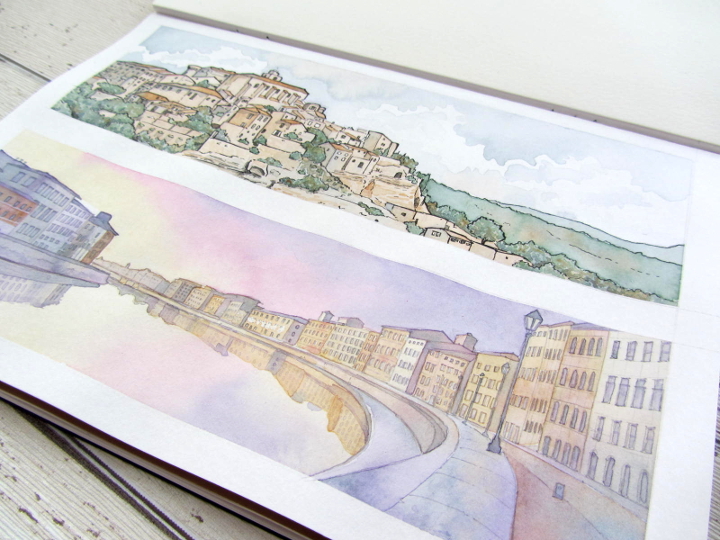 Your watercolored artwork looks amazing! Something I’ve always wanted to try. Thanks for the inspiration! You have created some gorgeous work! I love your linework and the colours are definitely working well. 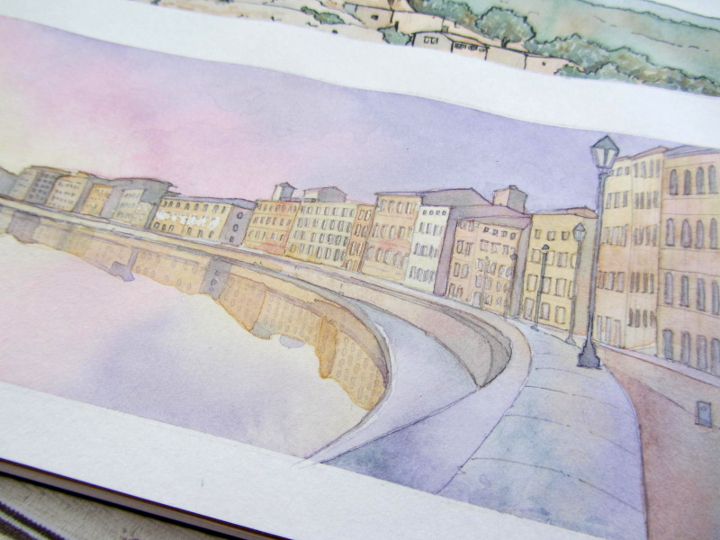 Watercolours are scary on a good day, but you appear to have them well under control. Out of curiosity, what ink pen do you use for the linework? Is it a waterproof pen? I really need to investigate watercolours in more detail, I have the equipment, I admire the work that can be created, particularly your lovely clean work here. I guess I’m just spoilt by my acrylics. Beautiful work in a daunting medium – my favourite? That reflection you’ve created in the water – stunning. Stunning, I think they are both stunning. That top one is a little bit Game of Thrones-y, lovely! These are both amazing but I do agree the second one is spot on. Very nice indeed.